In a new video, Jeroen Tromp a professor in the Department of Geosciences at Princeton University describes how he and his team are imaging the earth’s interior with Summit, the world’s fastest supercomputer. 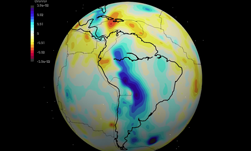 “The goal of our research is to image the Earth’s interior on a global scale. We’re basically 3D cartographers of the Earth’s mantle,” Tromp said. The Theoretical & Computational Seismology Research Group at Princeton University helps develop and maintain open-source software used for simulations of acoustic and poroelastic wave propagation. For this project, the team used years’ worth of earthquake data from around the world to create a simulated 3D picture of the earth’s interior. To refine the algorithm the team uses real-world earthquake observations and synthetic data to determine variables that need to be adjusted. “We are trying to make images of the variations of the seismic wave speeds in the mantle,” Tromp said. The memory of the NVIDIA Tesla V100 Tensor Core GPUs installed in the Summit Supercomputer at the Oak Ridge National Laboratory is already making a big difference in terms of performance, Tromp said. The team has also developed a beta version of a machine learning tool that is helping identify suitable earthquake measurements that can be used for the project. Tromp has published several papers describing his methods and techniques. The most recent titled, 3D elastic full-waveform inversion of surface waves in the presence of irregular topography using an envelope-based misfit function, was published in the Society of Exploration Geophysicists journal last year.